So a bunch of TLJ-haters want to remake it to "save Star Wars". Rian Johnson begged them to do it. I think it's funny. Luke was treated like a chump and to me that is a slap in the face of everything that has been done previously. Its the purposeful deconstruction of the character the Jedi in general. It will be a hard life. One without reward. Without remorse. Without regret. A path will be placed before you. The choice is yours alone. Do what you think you cannot do. It will be a hard life. But in the end you will find out who you are. “That’s the crux of my problem. Luke would never say that. I’m sorry. Well in this version, see I’m talking about the George Lucas Star Wars. This is the next generation of Star Wars, so I almost had to think of Luke as another character. Maybe he’s Jake Skywalker. He’s not my Luke Skywalker, but I had to do what Rian wanted me to do because it serves the story well”. Luke Skywalker: "I can't. It's too big." Yoda: "Size matters not. Look at me, Judge me by my size, do you? And well you should not, for my ally is the Force. And a powerful ally it is. ... (a lot more wise words) ... yes, even between the land, and the ship." Luke: "I don't.... I don't believe it!" Luke gave up after one try with his X-Wing. Gave up, walked away, even told off his Jedi Master. Why would complete failure of his first Jedi training school elicit a different response than giving up? He failed his nephew, almost killed him. He failed all of the other students he had, as he was not there for them due to his inappropriate actions against Ben Solo. How about Luke over Endor? Luke: "Vader's on that ship." Han: "No don't get jiggerty, Luke. There's a lot of command ships." Luke: "I'm endangering the mission, I shouldn't have come." Han: "It's your imagination kid. C'mon, let's keep a little optimism here." Luke was fatalistic in nature during Return of the Jedi. He told the Emperor "You're wrong. Soon I'll be dead and you with me." He felt everything hinged on him. Luke is very "one and done". If it doesn't work the first time, he basically wanted to give up. The only time he ever came back from his "give up" attitude was when, upon defeating Vader, he heard the cackling of the Emperor and he re-focused. During that re-focus, he decided the best thing to do was to throw away his lightsaber in the face of the Emperor. C. The "birth" of Kylo Ren, who would obviously go on to be something of a scourge against the good guys. If he felt personally responsible for that, I could very easily see the old Luke coming out and going "I've endangered the whole galaxy. It's my fault more people are dying." and then deciding to "walk away" as he did on Dagobah when he failed to lift the X-wing after one attempt. I bet he did after visit from Disney's lawyers. Like adding picture and special effects somehow surpassed/dimmed the hero's actions and his motives, riiight. Luke: "Sorry guys. I screwed up. You on your own now, I cannot help you with getting back your son." Han: "Kid, you did not gave up on Vader, me and Leia believe in you!" Luke: "I cannot help you, I will retire and train no more. But I will leave you with a map of no use"
Yoda showed up much too late to guide Luke. Or seeing his actions in context of the rest of the movie. Seeing what is there after editing, seeing how he links in to the other stuff going on, and so on. I just came across this video on YouTube. It was posted two weeks ago by a page called ComicArtistPro Secrets. I tried to independently reference the Tweet thread shown in the video, and while I could find the initial Tweet referenced (the one about how Ackbar was unsuited for the Holdo role as Poe would've naturally trusted Ackbar, and the plot required someone in authority who Poe distrusted), the comment thread referenced in the video has since been deleted. In fact, in the video, you will note that the Tweet in question shows 4 Replies, but the version currently on Twitter only shows 3. It's likely that the guy who posted the original Tweet deleted it, possibly because of what he revealed. Anyway, here's the video. The title will pretty much give it away, but the relevant Tweet as evidence is shown at the 6:00 mark. Bear in mind, this guy is very clearly not a TLJ fan, and makes no attempt to hide it. 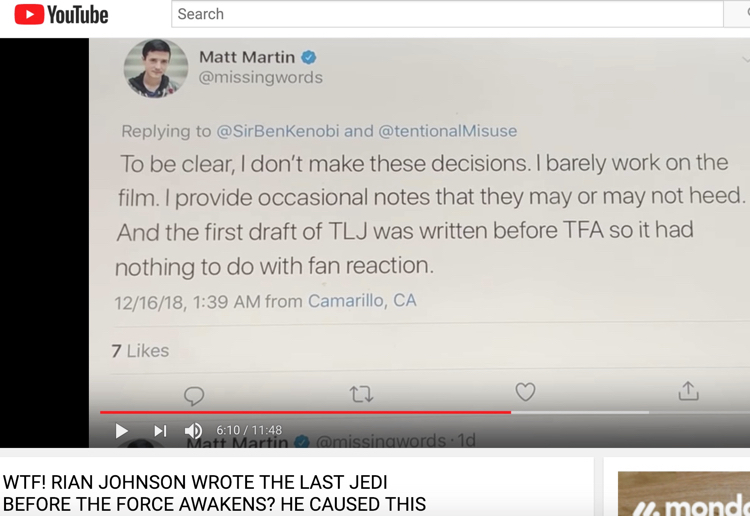 But what's pertinent here - and what Matt Martin let slip on Twitter - is that the first draft of TLJ was written before TFA. At first I was pretty shocked at the idea. But I'm not sure it's such a terrible thing to have an idea of where you want the story to be, and then write the first episode to bring us from an introduction up to where the second part of the story picks up. Speaker of the Dead was written before Ender's Game. And Ender's Game was pretty darn good. I mean, TLJ and TFA are no Ender's Game, but it just provides an example of how that can be a well-executed method of story creation. I've heard that done with other films supposedly, where the writer made part 2 of a trilogy before even completing part 1. One failure and he's given up. Well yeah. That's the Jedi way. Run and hide when the going gets tough. See also Yoda, see also Obi-Wan. Also, lie to your students. I was watching this video regarding Mary Sue characters in modern fiction. While Star Wars is cited for several examples, the premise is focused more on the general concept within film and literature. Bear in mind, this video looks at Mary Sues as something particularly common in SJW literature, and the narrator clearly takes a dim view of social justice, so consider yourself warned. Regular characters conform to the laws of their universe, while Mary Sues force the laws of the universe to conform to their character. He then goes on to point out that, while Anakin has many of the same qualities of a stereotypical Mary Sue, he diverges from the above requirement in that, even as powerful as he is, he still has flaws, still requires training to fully make use of his natural potential, etc. Rey, on the other hand, has been intentionally written as a character without weaknesses, whose abilities are simply given to her without seeming effort, in clear defiance of the laws of the Star Wars universe. As an aside, here's another video from the same page, describing why Palpatine works as villain with a mysterious background, while Snoke falls flat. The site has an obvious right-wing bias, but it's very on-point with the critiques from a story-telling standpoint. There is no low-brow Alt-Right ranting here, just a well-reasoned critique with some obvious opinions sprinkled in. Consider yourself warned. The quick flash-up image of Hilary Clinton (with words "not our emperor" or something like that) technically violates the 'no Hilary clause' of the 'no real world politics' guideline, but this 'blink and you'll miss it' reference isn't spoken to and I could totally ignore this if that were it. This video stated the sentiment that Disney Star Wars has a political agenda. It doesn't, and the differences in opinion on this are idealogical so discussion of this can only go downhill from here. As stated in the guidelines and discussed here, "Do not state or refer to any aspect of Star Wars having a political agenda. Do not share links to pages with political content." Not even "high-brow, moderate" ranting. However I acknowledge both of these things were done in passing and not the point of the video. I do not feel that CRMcNeill had any intention of taking this thread political by posting this video. So everyone, please consider this fair warning that there should be absolutely no discussion of any political topics here, including even mere mention of Star Wars having an agenda. Do not even reply to this comment. Thank you. I think the Snoke video has some good points, but again, the trilogy isn't over yet. It seems to me that a lot of the criticisms of these films are based on taking everything characters say at face value when some things may be later be revealed to be false, and mysteries not being answered before the final episode of the trilogy. Perhaps "channel" would be more appropriate; it seems to be the common parlance for a YouTube content creator with his own specific page on that site. And it was actually YouTube that put the first video (the Mary Sue one) in my recommended videos section. From there, I watched several more, and I was impressed with the guy's grasp of the nuance and details of story telling, so I figured I'd share, with appropriate warnings as to the sort of political bent intertwined with the on-topic content. Understood. Thanks for clarifying about the channel. I'm not one to think of a YouTube channel as its own webpage, probably because my YouTube channel only has 2 subscribers. I do get it. Ackbar is derived from an Arabic Islamic phrase being "God is the greatest", and a tweet referred to Ackbar replacing Holdo in "9/11"ing the First Order. The video narrator described this joke as not PC but funny. This is unacceptable here. Not because it is "not PC". Because this is anti-religious discrimination. The 9/11 terrorists are not recognized by mainstream Islam as even being Muslim. The president at the time of 9/11 also stated this and referred to Islam as, and I quote, "a noble faith". Please avoid politics and religion, including anti-religion, including posting links to content of this nature. Again, I realize this was not the point of the post, but please consider just summarizing the content of the videos without including links. These YouTube videos are just fans with opinions on the internet like we are, so citing where you got the idea of your post is not always necessary. I'm not at all surprised to hear that the first draft of TLJ may have been completed "before TFA". JJ Abrams and Rian Johnson were both hired to make individual Star Wars films independently of each other with a maximum creativity over their respective films. I think the video narrator and some viewers are reading meaning into this tweet and overreacting. It doesn't state what specifically was TLJ's first draft written before. TFA's first draft? TFA's shooting script? Perhaps TLJ's first draft was completed before TFA's first draft. Before first drafts are story outlines, story treatments, etc. and both films' stories evolved over time. The basis of Rey's character (originally named Kira) was created by Michael Arndt, the screenwriter who was originally hired for TFA, and that was before Abrams or Johnson were hired to direct SW films. This tweet doesn't necessarily mean that Rian Johnson created Rey, Ren, Finn, Poe, Snoke, Phasma, etc. It doesn't mean that Rian Johnson had a complete vision of his film and dictated to Abrams what he had to do in TFA to set-up TLJ. It doesn't mean that TFA's story was subservient to the story of TLJ. Abrams and Johnson met and shared ideas, but neither was beholden to the other. I enjoyed TFA a lot more than TLJ, but to be fair this doesn't at all mean we can blame Rian Johnson for Abram's "mystery box". Johnson asked Abrams to make some minor changes to TFA and Abrams said he made made most of them but there were a few he felt were wrong for his film so he denied them. They didn't specify what they were, but Johnson admittedly moved Ren's scar. Nonsensically for TLJ, the cynical Luke who turned his back on the Jedi had been waiting for Rey in his Jedi robes, and then quickly changed in his next scene. There is no reason for Johnson's Luke to be wearing Jedi robes before the end of TLJ, but Abrams had Luke wearing them anyway. It seems likely this was something Abram's denied because he felt his movie should end with Luke in Jedi robes regardless of where the story was going next. Now this tweet does support what I suggested about there being a bare minimum of required restrictions for both films as in a 'no-kill character list' which Snoke and Phasma were not on. I feel the most important part of this tweet is the first three sentences. It isn't surprising, but this confirms the Story Group is subservient to the filmmakers. They provide notes that may or nay not be heeded. He sounds rather monotonous. BUT his logic is sound.